DUBOIS — There were only five matches left when freshman Karson Kline (5-2) took the mat and grunted out a hard fought 5-2 decision over Braxton Adams, putting Clearfield ahead of DuBois 36-9. It looked like the Bison might pull an early season upset over the defending district champions, but it wasn’t to be Friday night. Over the course of the next five matches, DuBois racked up three pins, a forfeit and a major decision to win the match 37-36. 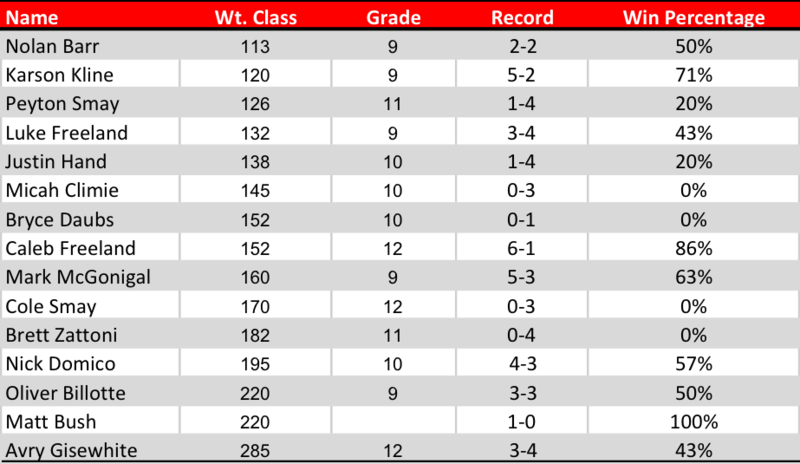 But outside of the “Murderers Row” that DuBois had lined up from 126-152, Clearfield looked good on the night, winning seven of the 14 bouts even without Oliver Billotte and Jude Pallo, both who expect to return to the lineup soon as they recover from injuries. The match began at 160 pounds, where Bison senior Caleb Freeland (6-1) put the Bison on board with a first period fall over DuBois’ Evan Way. Right after that DuBois forfeited to freshman standout Mark McGonigal (5-3), choosing to bump their weighed in wrestler up to 182 pounds to wrestle Brett Zatoni (0-4). Zattoni wrestled tough for Clearfield, as the junior battled hard for six minutes and only gave up a 5-1 decision to DuBois’ Garrett Starr, putting the match at 12-3 Clearfield. Following that, sophomore Bison Nick Domico (4-3) found himself in a tight match against the Beaver’s Eric Schneider. After a scoreless first period that had plenty of action, Domico chose to start the second period in the bottom position. Domico was ridden tough and nearly gave up back points, but he fought through it and caught Schneider out of position, reversing him to his back and getting the fall in 3:25. This boosted Clearfield to a 24-3 lead once the Bison grapplers also received another six points from Matt Bush (1-0) who picked up his first varsity win with a forfeit at 220. Heavyweight was one of the biggest matches of the night, as it was a rematch of last year’s 220-pound consolation finals district matchup between senior Bison Avry Gisewhite (3-4) and DuBois junior Alex O’Harah. O’Harah pinned Gisewhite last year, but Gisewhite was able to maintain his composure for six minutes and avoid giving up a big throw, enabling him to edge out O’Harah by a 3-2 score. This put Clearfield up 27-3. Clearfield gave up a forfeit at 106 pounds, but freshman Nolan Barr went out at 113 and quickly picked up six points for Clearfield with a pin in 1:44. And after his teammate Kline won by decision, Clearfield seemed to be doing great. But knowing that the best of DuBois was just beginning, the victory still required Clearfield to at least lose by a decision in one of the last five bouts; a feat easier said than done. DuBois’ Chandler Ho was a favorite to win regionals at 103 pounds as a freshman last year before he was injured and didn’t participate in the post-season. He received a forfeit at 126. DuBois’ Trenton Donahue won regionals two years ago before being ineligible to wrestle as a sophomore. He quickly pinned Bison junior Peyton Smay (1-4) in 1:01. At 138 pounds, Clearfield sent out sophomore Justin Hand to wrestle Ryan Gilderseeve, where he was major decisioned 16-4. Moving up to 145, junior Ed Scott of Dubois faced off against freshman Luke Freeland (3-4). While Freeland is doing very well as a freshman, Ed Scott is a two-time regional champion known for his punishing wrestling style that makes most wrestlers give up. Scott threw Freeland around, used menacing half nelsons and downright nasty armbars. While Freeland wrestled tough and did his best to not be pinned, he couldn’t face the constant bombardment of power moves that Scott unleashed, and he was eventually pinned in 3:17. This made the final matchup at 152 pounds crucial for Bison sophomore Bryce Daubs (0-1), crucial to not get pinned. The problem is, he was wrestling yet another previous regional champ in Beaver Dalton Woodrow. Woodrow pinned Daubs in 1:29, and with that the crowd rose cheering on Woodrow who had earned his 100th career victory while also beating the battling Bison’s by a single point. Still, head coach Jeff Aveni seemed to be very pleased with his team’s performance. He noted that if Jude Pallo was in the lineup at 138, he believed that would’ve been an 11-point swing in Clearfield’s favor. He also said that he would have a 106 pounder soon, and that would have been another 12-point swing. With a 23-point total swing in play, it seems Clearfield is in a very good position for districts in February. The Clearfield Bison will now host Huntingdon on Tuesday, December 18 at the Art Weiss Gymnasium. The Bison are 0-2, but the season is young and the team is moving through the fire.